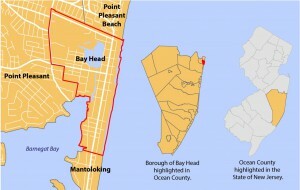 Things are moving along for bicyclists and pedestrians in the Borough of Bay Head, New Jersey. 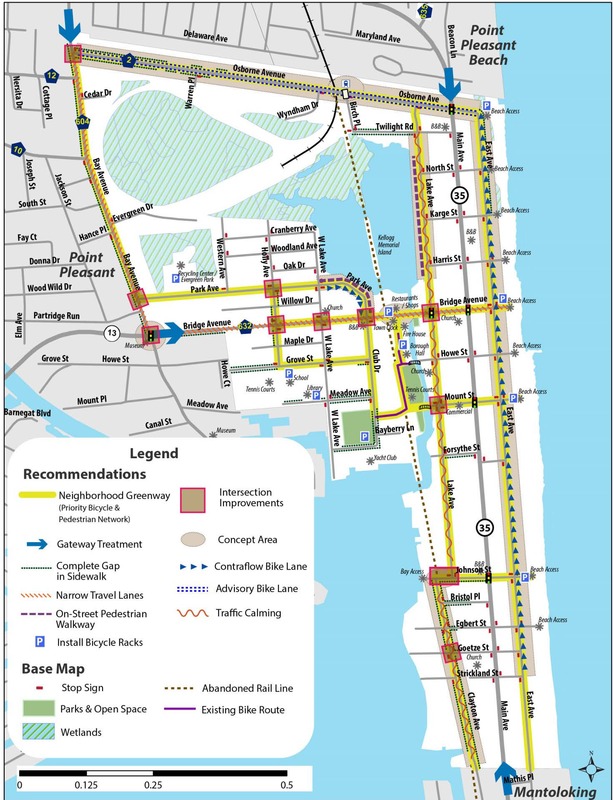 In December of 2015, the Ocean County municipality and popular shore destination adopted a Bicycle and Pedestrian Master Plan under the guidance of Complete Streets visioning. Seven months later, in July of 2016, Bay Head Momentum, a local non-profit interested in promoting “health and wellness of the residents and guests of the community” released a progress report (PDF) on the implementation of the plan. Structured like the plan itself, the progress report outlines advances in 5 key planning areas (The Five “Es”): Education, Encouragement, Enforcement, Engineering, and Evaluation/Planning. For Education, the borough has deployed three initiatives: Bike Safety Week at Bay Head School (elementary), a new Summer Bike Safety Education program (throughout Bay Head), and has published a BIKE SAFE flyer for general distribution (awareness). For Encouragement, the borough is in its 5th year of “Walking Wednesdays,” an initiative that encourages students to walk and/or bicycle to the Bay Head School. For its efforts, the Bay Head School was recognized with a Gold Certification from the Safe Routes to School program (SRTS, like the BPRC, operates as a project of the VTC, NJDOT, and the FHA). Additionally, the Mayor’s office is continuing its “Mayors Walks” events during the summer, and has now begun “Mayors Bike Rides” (both part of the Mayor’s office’s ongoing wellness campaign). 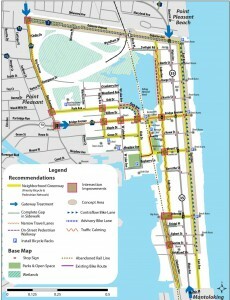 To encourage safety and Enforcement of city rules, the Bay Head Police department continues to deploy a Bicycle Patrol unit (consisting of 4 officers), whose “primary role is parking enforcement and public relations” (Susan Montgomery – The Ocean Star) and has implemented a “Wear a Helmet” campaign. 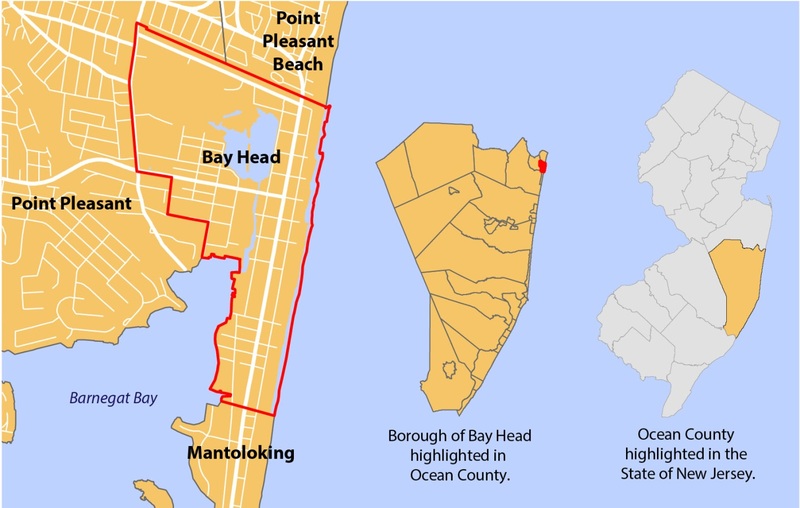 Aside from public outreach and education initiatives listed above, the Borough of Bay Head has taken significant steps toward Engineering, by initiating capital projects in support of its Bike/Ped Plan. Five major project areas have been identified: Town Center, Karge St./Chadwick St., East Avenue, Strickland St./Howe St., and Clayton Avenue. 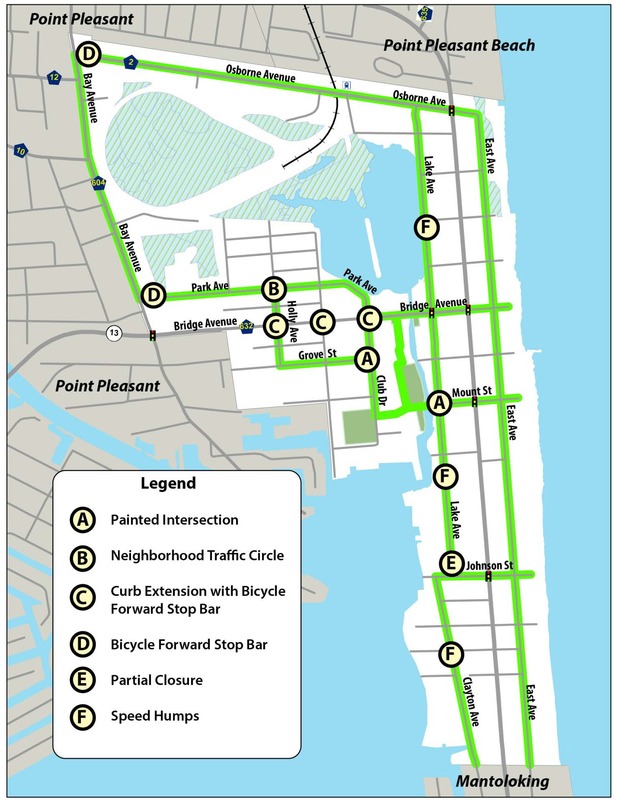 These areas are underpinned by the broad vision of a Neighborhood Greenway Network that aims to deploy “Complete Streets” throughout the borough in support of “enhanced conditions for both bicyclists and pedestrians”. Specifically, in the Town Center, new bicycle parking has now been added in front of the post office and throughout town more than 60 spaces have been added. The borough has also added a bicycle repair post at the Fire Station, and published a set of general bicycle parking guidelines. A new contraflow bike lane is scheduled to be added to East Avenue later this fall with additional signage and striping and without eliminating parking. A new stop sign has been added to Clayton Avenue for which preliminary design for a sidewalk has been completed, a grant application submitted, and further analysis is ongoing. Finally, based on DOT recommendations, new crosswalks have been added at Strickland, Howe, Karge, and Chadwick Streets along Route 35. Further studies of right-of way issues on the east side of Clayton Avenue and the Twilight Lake Bridge are ongoing. Moving forward, the borough will continue implementing projects already underway, Evaluating its progress so far, and will begin the process of identifying the next set of priorities and funding sources for infrastructure planning and improvements. 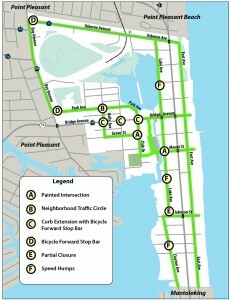 As the Asbury Park Press reported in April of 2015 and 2016, the Bicycle and Pedestrian Plan was developed as an adjunct to Mayor William Curtis’ wellness and healthy lifestyles initiative “Go Bay Head” and after summertime public meetings and in consultation with RBA Group, State DOT and the Bay Head Steering Committee. At the behest of the town, RBA deployed public engagement through visioning workshops, open houses, a project website and surveys, and “identified barriers, gaps in connectivity” and evaluated the receptiveness of local infrastructure to bicycle traffic. The primary funding for the study was awarded via NJDOT’s Local Technical Assistance Program. You can also click HERE to download the report, and HERE to see the appendixes.